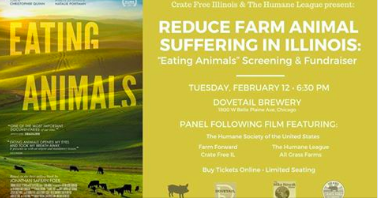 Join Crate Free Illinois, The Humane League, The Humane Society of the United States and others for a showing of the documentary Eating Animals and a panel discussion on panel titled Reduce Farm Animal Suffering in Illinois. This important event takes place February 12 at Dovetail Brewery in Chicago’s Ravenswood neighborhood. Crate Free Illinois also will be an exhibitor at FamilyFarmed’s 2019 Good Food EXPO, March 22-23 at the UIC Forum in Chicago.